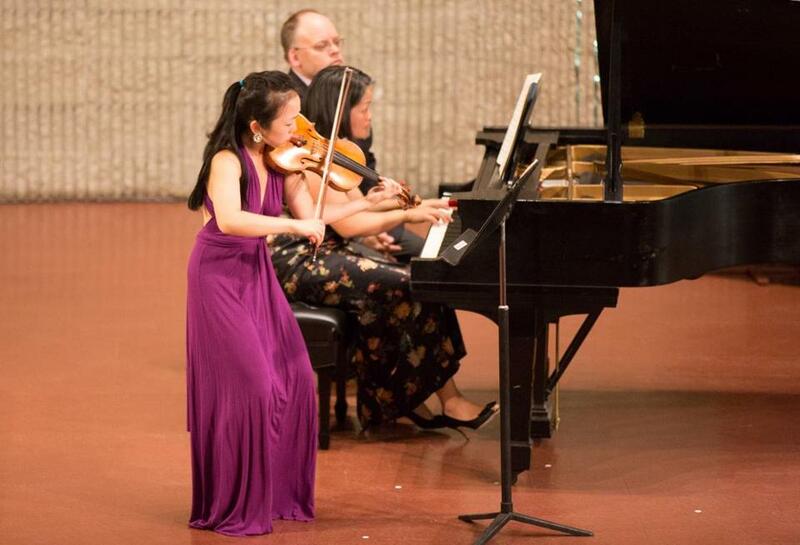 Violinist Jessica Lee and pianist Vivian Chang-Freiheit perform with Chameleon Arts Ensemble. Chameleon Arts Ensemble’s final program of the season was titled “where light and shade repose,” a nature theme which most of its works shared. Listening to the diverse works assembled, though, another thread suggested itself: a dialogue between the virtues of concision, on the first half, and expansiveness, on the second. Saturday’s concert at First Church in Boston opened with Alan Hovhaness’s mystically tinged “Upon Enchanted Ground,” which consists largely of a dialogue between flute and harp, with subtle underpinning from the cello and ominous interpolations from a giant tam-tam. It’s brief yet captivating, breaking off in midstream just when it seems to have settled into a groove. Scored with a similar sense of iridescence was “66 Times: The Voice of Pines and Cedars” for soprano and chamber ensemble by the Taiwanese-born composer Shih-Hui Chen. There are four settings of Japanese poems (in translation), each of which compactly sketches the natural beauty and affective power of one of the seasons. Here the concert’s title seemed most apt, as each song masterfully balances illumination and shadow. The third poem, “when the warm mists veil,” is the shortest; it is sung three times by the soprano — the superb Ilana Davidson — and each time it gains in color, harmonic depth, and emotional weight. The final song, after a fierce outburst, dissolves in a haze of percussion. Beethoven, of course, was a master of succinctness when he cared to be, and the “Spring” Sonata for violin and piano is emblematic of his unerring ability to tease out material without wasting a note. The piece is usually thought to belong to Beethoven’s early period, but the extroverted performance by violinist Jessica Lee and pianist Vivian Chang-Freiheit placed it closer to the middle of his career. Their take on it was bold and dramatic, but there were few truly quiet moments, and several stretches lacked much sense of dynamic variation. The second half was given over to Bruckner’s String Quintet, the best known of the composer’s few surviving specimens of chamber music. It telescopes the breadth of a symphony into a five-instrument piece. Sometimes this works brilliantly — the Adagio is as beautiful as any movement he wrote — and sometimes it doesn’t — the finale is long-winded, as Bruckner’s sometimes were, yet without the color provided by an orchestra. At all events, the performance was superb. The five string players — violinists Lee and Karen Kim, violists Scott Woolweaver and Peter Sulski, cellist Rafael Popper-Keizer — brilliantly navigated Bruckner’s terrain by keeping the momentum going and producing a sound that was both luxurious and clear. I can’t imagine a better case being made for this hybrid work.